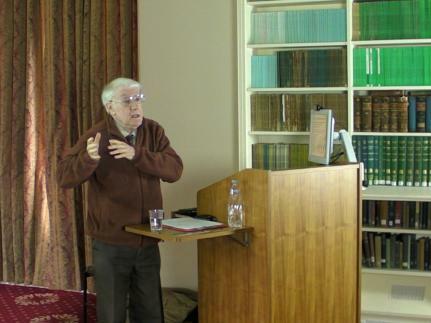 On 14 May 2015 Dr Howard Jones lectured on Alfred Russel Wallace at Lampeter. Wallace was born into a humble family, in Monmouthshire, and was largely self-educated. He became a man of many skills and many interests, which in the 1840s extended to include spiritualism. Lamarck’s ideas were relatively new, and in the absence of knowledge of genetics were not questioned at the time, as they were later. It took the advances of our own day to show how, by complex causations, the inheritance of characteristics acquired through the working of other mechanisms is indeed a fact. Darwin attributed changes to the selection of successful characteristics in individuals, but Wallace stressed the importance of the evolution of whole populations. Today we begin to see how rational is a multiplex interpretation of the causes of evolution. This reinstates both Wallace, without reinterpretation, and even Lamarck. However, the narrow mechanistic process posited by Darwin has appealed to the materialist and atheist scientific mind, and did, for a while, oust the broader view, but a more holistic schema is now rapidly gaining ground. Wallace’s Malaya expedition produced the crucial ‘Sarawak Law’, in fact equivalent in scope and substance to the whole of Darwin’s theory of evolution. Interestingly, Wallace’s observations showed him a hiatus amongst the species of the far East, now known as the Wallace Line, which conjoins with Wegener’s hypothesis of the movement of continents and so provides corroboration of what is now termed plate tectonics. The differences between Darwin and Wallace are differences of emphasis rather than deep differences of kind, and what worried Darwin in 1858 when Wallace surprised him with his theory of progression of the fittest was that, to most intents and purposes, he was being presented with his own theory penned by the other man. However, differences there were, not least in personality and outlook. Wallace was always concerned with the history of whole populations, not with individuals, which gave a different view from Darwin’s. Similarly, Wallace had respect for the indigenous human populations amongst whom he traveled to collect specimens and observations, whereas Darwin, from a more affluent family than Wallace, accepted the habitual view of his age that the non-European peoples were inferior, and should be converted to Christianity. During the question time after the lecture Charles Griffin, author of the book Darwin Plus, expressed the view that Dr Jones had been a little hard on Darwin, pointing out that only one edition of Darwin’s Origin of Species did not mention the Creator. Eric Franklin sought to set the context of scientific hypothesis-making by describing the two complementary mechanisms of scientific research, the arc which generates hypotheses on the ground of observations, and the complementary arc, completing one turn of the spiral of progress, starting with a hypothesis and subjecting it to rational testing. The Cambridge mathematician, A R D Mathias, wondered whether the claimed spirit communication between Sir William Crookes and the mathematician De Morgan, then deceased, had been recorded in any way. Others made their own contributions to a notably intelligent discussion period, too long to report here, but now available on DVD, along with the lecture itself. If you would like a copy, please email the convenor <[email protected]>.